To ensure healthy dental hygiene habits that will last a lifetime for your children, it is important to develop a good dental routine from an early age. This means regular brushing, regular flossing and routine check ups twice per year to the dentist. To avoid pre-mature dental work and issues, it is important to foster an oral care routine that focuses on thorough teeth cleaning at least twice per day. However, most parents and children struggle with figuring out the best way to stay consistent with this daily task because it is definitely not the most exciting thing they will encounter. I have found it is all about making oral hygiene fun so kids want to make it an integral part of their morning and night time routine. As a mother, I had an extremely tough time making my boys get consistent with the habit. However, on the other hand, I have seen many toddlers take to brushing much easier! Where did I go wrong? One thing that helped me in the long run was to make their brushing sessions more rewarding. One of the best things you can do is to buy a cool and attractive toothbrush that catches their attention. How Early Should You Teach Your Child To Brush His/Her Teeth? This adorable little toothbrush is a lot more than just looks. Manufactured by the most recommended toothbrush brand, Oral-B, this is among the best electric toothbrush for kids available on the market. The electric toothbrush comes with powerful rotating heads that are capable of reaching and cleaning multiple surfaces thoroughly. It also has an uplifted center row of bristles designed to clean chewing surfaces. The Oral-B Kids Battery Power Toothbrush is powered by one AA battery and has an auto shut-off option. This means that it will stay on for exactly two minutes so that your child’s teeth are cleaned properly, and then it will shut off letting them know when it’s time to stop – all thanks to the Magic Timer App. Oral-B came up with collectible characters including Disney Princesses and Star Wars to help encourage children brush regularly. The only downside of the toothbrush is that parents have to dispose of it once the head is worn out or damaged as the heads are not replaceable. 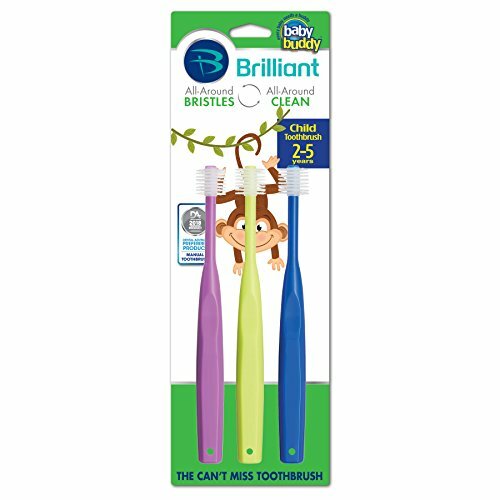 This is the best toothbrush for kids if you are looking to develop good oral care habits among your little ones. The product features a unique tongue cleaner that is soft and supple. 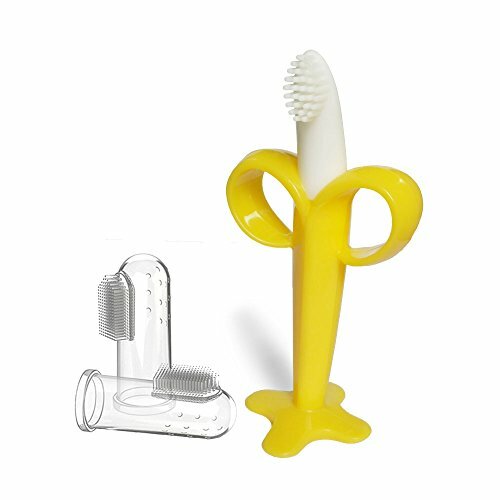 For kids, this is an easy to grip and hold toothbrush because of a rounded handle. The kid’s brush also has a suction cup at its base for easy upright storage. Personally speaking, I did not see suction cup as a key aspect or feature in this toothbrush, but trust me, they have proved to be more valuable than I previously thought. 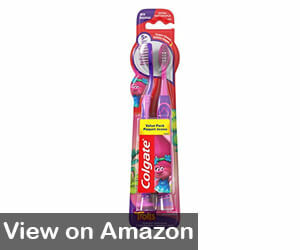 Colgate went a step ahead with its new and innovative Interactive Talking Toothbrush for Kids. The kids rechargeable electric toothbrush is designed on a Teenage Mutant Ninja Turtles (TMNT) theme. It also features character voices that coach your child when they should brush a particular quadrant of their mouth. Your little one will stay motivated as the talking toothbrush congratulates them if they brush for a full two minutes. The toothbrush also features a small oscillating head that gently cleans your teeth. 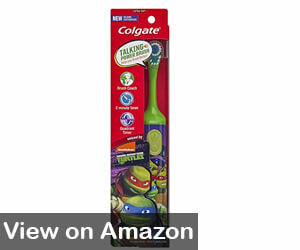 With extra soft bristles, the TMNT talking toothbrush will sweep away plaque easily. However, parents do not like the idea that the brushing motion is paused when the character voice turns on to coach the kids. 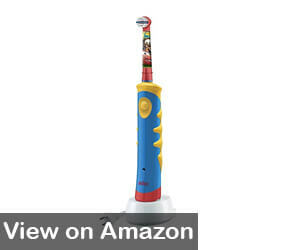 Rest assured the interactive talking toothbrush will encourage your kids to maintain good oral health at all times. This unique manual toothbrush has become a favorite for its ultra-soft bristles. 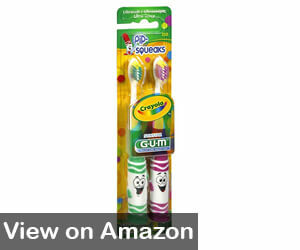 The Crayola Pip Squeaks toothbrush has made taking good oral care fun for children. Available in different colors, GUM’s toothbrush gives a gentle feeling to toddlers. There are numerous reasons like the head size conveniently fits in all mouths as the head is narrow and tapered. The manual toothbrush also comes with raised bristles that helps your child clean all ‘hard to reach’ places easily. Another good addition is the suction cup base. I can safely say there has been no easier way to store a kid’s toothbrush when it is not in use. 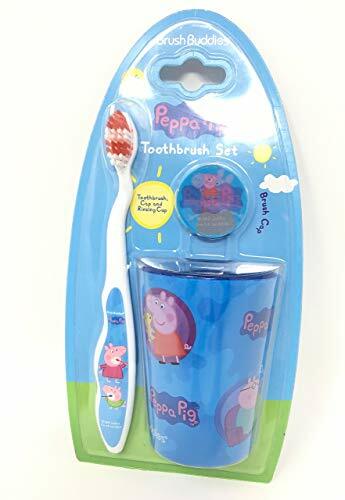 Therefore, you can get your children to develop healthy habits early on with this toothbrush. 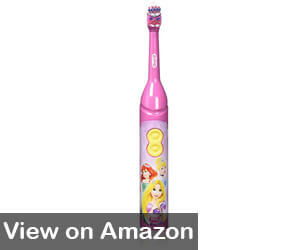 If you have a child who is a fan of Disney, this manual toothbrush is best suited for you. 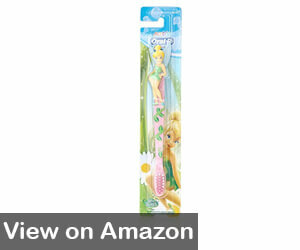 Designed on the theme of Disney Fairies, Oral-B manufactured the kid’s toothbrush with extra care so that they stay highly motivated to brush regularly. Children are not aware of the importance of maintaining healthy oral care. With these themed products that catch their attention, they are more likely to brush twice a day. This toothbrush also features a special handle so that your toddler can firmly grip the handle. For manual toothbrushes, this one is definitely at the top of the list. This Oral-B Kid’s Power Toothbrush comes with rechargeable batteries along with a design of Disney characters on the toothbrush. The product is carefully designed so that it features powerful rotating heads to reach and clean multiple surfaces thoroughly. 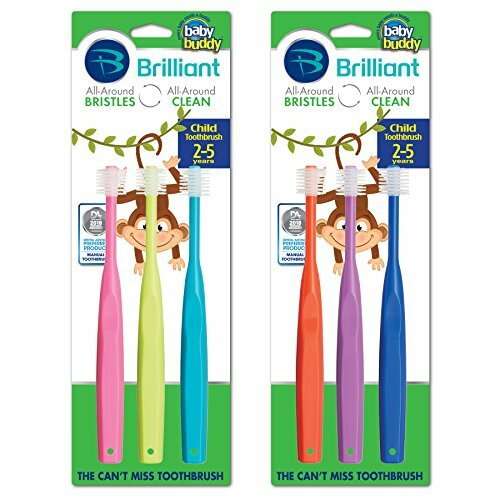 It also has extra soft bristles so that your toddler can gently clean teeth without hurting their gums. What’s more is that Oral-B has come up with an ergonomic design for the toothbrush handle so that children with smaller hands can hold it tightly. When compared to a manual toothbrush, this product ensures a superior cleaning without putting in additional effort and technique. The biggest advantage of this toothbrush is that it has a rechargeable battery. Of course this means you will save money on batteries and you can teach your child responsibility to plug it back in after each use. That will come in handy when they start taking your phone to play games! To keep children motivated, the toothbrush includes 16 melodies which can be changed by pressing the button on the handle. Children are not likely to understand the importance of regularly teeth cleaning even if we tell them horrible stories. The smart way to get your child comfortable with brushing is simple playfulness and comfort. When they have matured enough to move and hold the toothbrush, it is important to encourage them to brush and clean their teeth themselves. Such skills are not just fun but help foster their learning experiences. 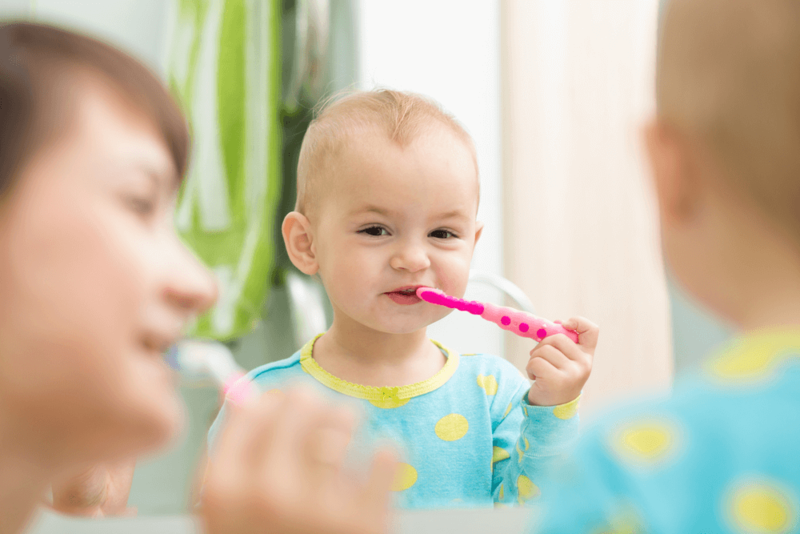 When should you make your child start brushing his/her teeth? It is extremely important to teach basic oral care and hygiene from an early age. You can start taking care of your baby’s oral health even before the first tooth surfaces. You can begin by wiping away the bacteria and plaque using a soft toothbrush. After the first tooth erupts, you should start brushing it and all the others that follow with a regular toothbrush. For starters, use a gentle toothbrush and apply a small amount of toothpaste and gradually increase the amount when other teeth appear. There are several toddler toothbrushes available in the market. 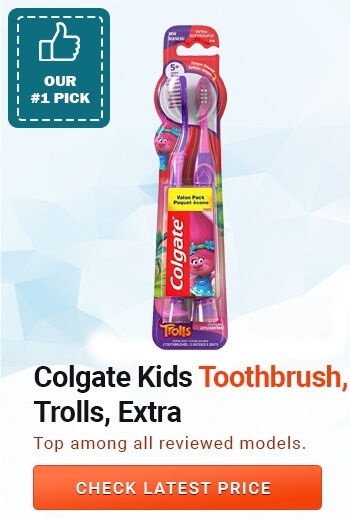 Since these toothbrushes are quite inexpensive, you can easily switch to another brand if they wear out or if your little one gets bored of the design or functionality. All children love finger puppets. With finger toothbrushes, you can sort of trick your baby into working during his playtime. Finger toothbrushes are extremely soft and are ideal for children with a few teeth. You should start with brushing and cleaning their teeth yourself, and give them command once you are comfortable. Almost all children love gadgets, and electric toothbrushes are no exception. With these toothbrushes, all you have to do is switch it on and let it do its magic. A few toothbrushes also come with timers so that the teeth are brushed for a solid two minutes per session (Source). Unlike most finger toothbrushes, a typical toddler toothbrush has a larger head with more bristles. This helps the child easily brush the back teeth ‘molars’ that appear as the child turns two. In such a toothbrush, you will have to make the brushing motions on your own. There are no shortcuts with these basic toothbrushes, kids have to work hard for clean teeth! When it comes to buying a toothbrush for your toddler, it is of high importance that you pick the right one. Typically, children at this age do not like brushing while parents try very hard to develop this habit. Choosing the right toothbrush can do wonders.